Calories don’t count, carbs are bad for you and dieting is a waste of time because you will just gain the weight back anyway. 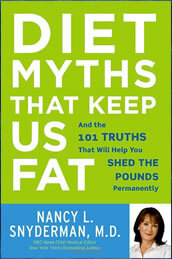 Nancy L. Snyderman, medical doctor and journalist, attempts to clear up these common dieting myths along with many others in her book, Diet Myths That Keep Us Fat. She examines and dispels each of these ten diet myths and explains how they are interfering with our ability to lose fat and maintain our ideal weight. Each chapter also includes a number of “truths” – supported by scientific research – that provide a greater understanding of the subjects being explored. One of the major dieting myths that Snyderman attempts to debunk is the concept that calories don’t count. She recommends that dieters monitor their calorie intake to increase the chance of successful weight loss and includes a meal plan that provides 1200-1500 calories a day. Snyderman suggests you follow her nutritious meal plan six days a week and then take Saturday or Sunday to enjoy your favorite foods in moderation with a “treat meal”. On dieting days you will eat three meals and two snacks that can be selected according to your preference from a list provided in the book. Whole-wheat bread, high fiber cereal, brown rice, fat-free yogurt, low fat cottage cheese, eggs, peanut butter, soy milk, turkey, chicken, salmon, beef, legumes, hummus, fruit, vegetables, low fat salad dressing, avocado, dark chocolate. Dieters are encouraged to do at least 30 minutes of exercise, five days a week. Snyderman highlights the health benefits of physical activity but does not include a specific exercise routine in the book. Diet Myths That Keep Us Fat: And the 101 Truths That Will Help You Shed the Pounds Permanently retails at $15. Challenges common dieting myths and replaces them with practical advice based on science. Includes a 7-day meal plan as well as thirty ideas for breakfast, lunch, dinner and snacks. Being able to enjoy one treat meal a week makes it easier to stick with long-term dieting. Meal plans are too low in calories for physically active dieters. Requires measurement of portion sizes. Encourages the intake of fish, such as tuna, which is high in mercury. Meal plan appears to be too low in essential fatty acids. Does not include an exercise plan. In this book about dieting myths, Snyderman identifies many common diet myths and replaces them with 101 “truths”, supported by scientific research and practical understanding. The basic premise is that restricting calorie intake is of most importance for losing weight and a meal plan is included that will help dieters to achieve this goal. Diet Myths can be ordered online by clicking here.